The new Duo Tandem Med from Dürr Dental generates compressed air in medical quality specially for the high demands in implantology and surgery. Greatest possible safety from one of the leading manufacturers of dental compressed air systems – the inventor of the oil-free dental compressors. Proven components "Made in Germany"
Implantological operations demands dry compressed air with the highest hygienic quality. This is achieved by the use of the new membrane technology and an innovative filter system. A pressure dew point of -27°C at 7 bar and a filter mesh size of 0.01 μm are only a few of the demands made on the quality of the compressed air. Added to that is an antibacterial interior coating of the tank for greater safety. 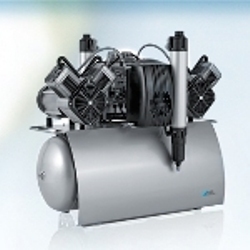 The compressor of the highest technological standard: Oil-free, dry and hygienic. The sturdy technology with two units and two membrane dryers offers high reliability during continuous operation.